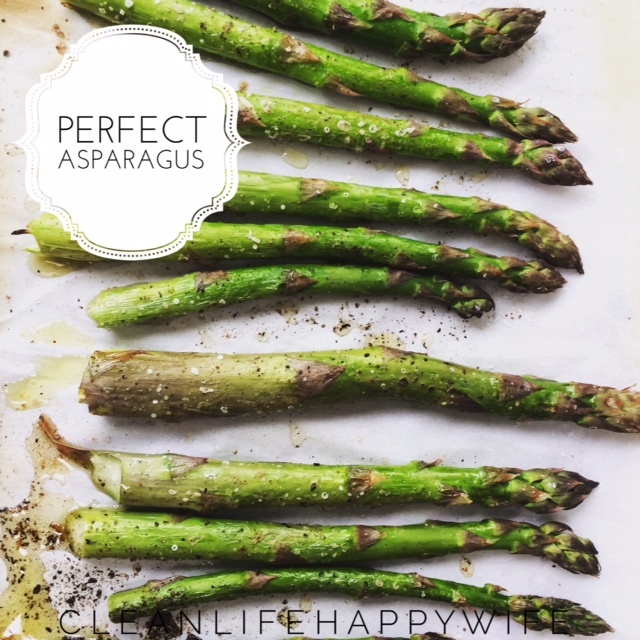 My absolute favourite veggie side is asparagus! Asparagus is a tricky veggie to cook. If it is made properly it is crunchy, juicy and delicious, but if it is made incorrectly it is limp, stringy and chewy. The most important tip: never and I mean NEVER boil asparagus! 🙂 I’m not sure who first circulated the method of boiling asparagus….but it was a bad…bad idea. It is very difficult to get the proper texture and maximum flavour from boiled asparagus. The good news is that the best way to cook asparagus is also one of the easiest! It only requires 3 simple ingredients. * Another delicious method is to BBQ the asparagus. Prepare the asparagus the same way with the oil, salt and pepper and then cook on the grill for approximately 10 minutes. You want the asparagus to stay firm and not limp. When asparagus is overcooked it get’s chewy and stringy. The flavour that these three ingredients brings out when cooked together is fabulous! When I serve this asparagus people often ask “WHAT is on this asparagus? !” The flavour actually tastes more complex than it is! People are always shocked that 3 simple ingredients can bring out such a full taste! This method can be applied to almost any vegetable! I cook my cauliflower, carrots, potatoes, peppers and brussels sprouts this exact same way!